I love this recipe. 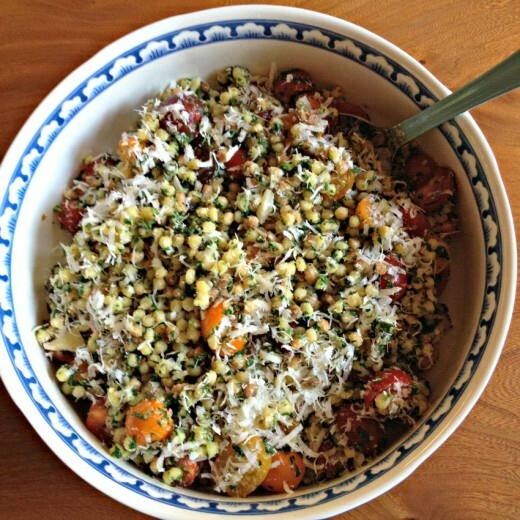 I usually roast my cherry tomatoes then throw them in w/ the Israeli couscous and kalamata olives, top with arugula and some olive oil and my favorite side dish is born. I moved from Australia to Chicago in 1998, along with the myriad of boxes my husbands extended family schlepped across for me , I also schlepped a 12 year collection of Australian Vogue Entertaining – do you know how much those magazines weighed ????? Due to lack of library/bookshelf space in our townhouse they mainly remained boxed and I would periodically bring out a box and leaf through with nostalgia , remenicing about the different dishes I made throughout the years . Fast forward to October 2003. move to new house , a 3 year old and 10 month old = no time to read anything , so everything went into long term storage , back into the garage . Fast forward again to 2009 major clean-up of said garage and the crashing reality , that I needed to part with these magazines because , I had changed and evolved as a person , CEO of Household , as I like to call myself ,the previous incarnation that enjoyed these magazines was single and free to try out interesting dishes. Unable to physically through them into recycling , I schlepped 6 boxes to a store that buys old books and interesting magazines and walked away with a princely sum of around $60.00 – which I promply spent on a couple of cookbooks that I use on a regular basis. So, all was not lost , I valued those mazagines , I enjoyed them during a time in my life when they could be enjoyed and savoured, but I evolved as a person and the memories will stay with me forever, and life has evolved, because we now have the WWW. I know you will find the strength to put down the scissors, have a quiet moment with them and gently pass them onto others that can enjoy them as much as you have. I am a huge food magazine whore! I have way too many, as in piles, on the floor in my office. Sometimes I feel like I mainly pick them up for the gorgeous photography, and barley use the recipes. That is a habit I am trying to break starting this month (after I tripped over them). I should start a system such as yours …. binder would be better then the box that holds my clippings! 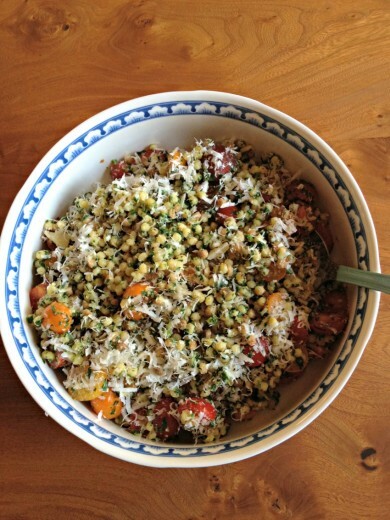 I love this salad and am going to add it to our devour board. Always looking for new and interesting veggie heavy recipes! This is such a great coincidence! I pulled this very recipe from my file a few days ago and am making this for dinner tonight. Can’t wait! I have a similar process with recipes I cut from magazine. My cut pages tend to sit in a stack waiting to be filed (for ages). But, I just started an ipad subscription to Donna Hay. I’m not sure how I’ll handle the recipes I want to remember from ipad issues. Is the blanching of the arugula necessary? Would the consistency, or the taste be off if I didn’t blanch it first? HOW DID YOU KNOW I have a freezer full of arugula pesto and a bunch of cherry tomatoes that are on their last legs? Thank you for this. Dinner tonight! I really hope this post gives me inspiration to sort through my magazines because I have about four years worth and I can never find anything in them! It would be so much but if I had some kind of organization scheme. Perhaps by season. Hmm. This salad does sound really refreshing! I just loved this post. It so describes my life. Oh, and the recipe sounds good too! I am drowning in a sea of recipes. I have binders all over the place, and rarely remember what I put anywhere even if they are categorized. I won’t have time to cook 1% of them before I die if I cook 24/7. Oh my, I love food! 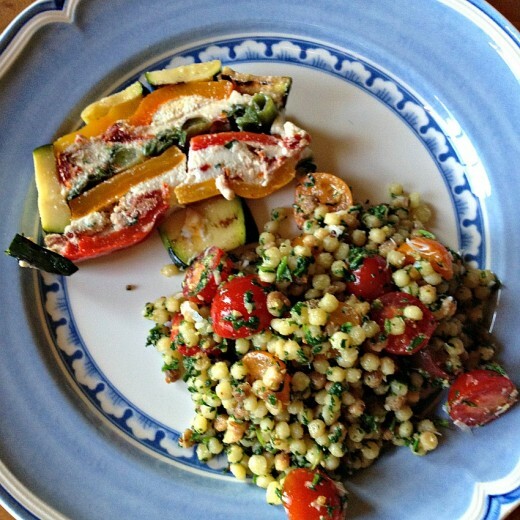 I’ve been searching for a recipe using Israeli couscous for a while now. This looks amazing! The combination of pesto and cherry tomatoes! Its going straight into the recipe folder for summer when the basil starts running wild again. This post is so timely for me. I’ve been thinking of doing my first ever magazine cull and I’m a bit scared! I’ve had a subscription to a food magazine since I was about 16 (usually Delicious, but also Gourmet Traveller and Cuisine – a NZ food mag). I’m in my mid-twenties now and the sheer volume of recipes to go through is overwhelming. I also feel a bit sad about destroying my collection, even though it’s crazy and impractical to have so many. Thank you for the inspiration to get a move on. The recipe looks so beautiful too. Best of luck preparing for the move Dana! I keep trying to tell myself it will show up in a box, but part of me knows I probably placed a box in the “donate to library” that should not have been there. Or, worse yet, I discarded it without realizing. I do subscribe to more than 10 cooking mag (English & French). Right now I have a closet full of mag ready to be cut out. Last yr I started to use Zinio on the IPad and gradually I am switching to digital. Love mags.